WANT TO KNOW MORE ABOUT THERMAL IMAGING? Need to find a radiant heat leak? Having an electrical fault issue in Connecticut?? 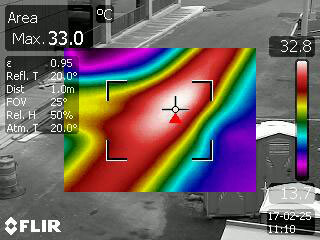 One of many tools ACS uses to locate leaks and other underground utility issues in Connecticut is thermal imaging (heat reflection) infrared technology. We often pinpoint steam leaks on pipes, radiant heat pipes, radiant heat tubes, and others with thermal imaging. We take multiple readings depending on your leak situation. Sometimes we take readings during the day, other times at night. Aerial readings from roofs can accurately identify any hot spots and problem areas. Thermal imaging is an excellent tool that complements any leak detection strategy. Water always chooses the path of least resistance so thermal imaging can help explain the often mysterious origin of water leaks and steam leaks that may be far from the physical evidence of damage. If you're in CT, Call 203.544.7190 with any questions or concerns you have about the thermal imaging and how it can help you with your underground leak or utility concern. Thermal imaging (photography) infrared technology can identify issues with electrical fuse boxes, overloaded electrical panels, and others. One frequent use of our thermal imaging is to provide detection of radiant heating tubes prior to cutting or drilling. Often our thermal imaging cameras are used to locate radiant heat tubes in conjunction with ground penetrating radar for a comprehensive service. Our infrared cameras can detect differentiating thermal patterns of buried heating pipes to pinpoint the exact piping locations and map radiant heat locations. Thermal imaging and concrete imaging paired together give you the most precise site clearing all obstructions prior to drilling. Call us at 203.544.7190 or email us to learn more about our infrared thermal imaging services in Connecticut.